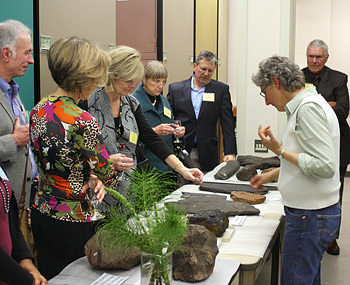 At a donor event in April 2013, Senior Museum Scientist Diane Erwin shows off some of the museum's finest plant fossils from its paleobotanical collection. Photo by Lucy Chang. Natural history museums house the living collections essential to understanding the richness of Earth and life history. Museums at world-class universities like Berkeley, provide powerful opportunities to integrate research and education with an added public purpose. Through the foresight of its early founders, benefactors, and renowned paleontologists, the UCMP has developed one of the largest and most heavily used university-based paleontological research collections in the world. UCMP's distinguished research history is complemented by a deep commitment to public outreach using innovative applications of the web to further the public understanding of evolution, and more accurately portray the nature and process of science. Great museums like the UCMP can grow even stronger by expanding their essential functions through new resources. In fact, UCMP's legacy is built upon the generosity of individuals motivated by an enthusiastic and deep commitment to the value of paleontological collections for research, education, and outreach  gifts by Annie Alexander in the early 1900s established our main endowment that is central to our day-to-day operation. More recently, UCMP received a gift of $1 million to provide a Hewlett Chair1 for UCMP, the Philip Sandford Boone Chair in Paleontology, with the goal of securing Berkeley's ability to continue to attract and retain Directors of the highest caliber. In this issue of UCMP News, we highlight new ways we are furthering the research and education missions of the UCMP through the launching of a capital campaign that focuses on areas of greatest need: (1) supporting graduate student research; (2) expanding and securing the future of our online education resources; and, (3) developing new ways of preserving the legacy of our collections. This capital campaign builds on the generosity of several recent gifts and donations. Our goal of increasing support of graduate student research (1) is centered on growing a new endowment, the Anthony Barnosky Honorary Fund for Graduate Student Support, just established through a very generous gift of $150,000 from a UCMP alum (see box below). We hope to secure the future of our education and outreach program (2), which includes UCMP's award-winning online resources Understanding Evolution and Understanding Science, by establishing a new endowment, the UCMP Fund for Education and Outreach (see box below). The seeds for that endowment have already been sown by Judy Scotchmoor, who many of you know. Finally, on a shorter timescale, we have embarked on raising funds to capture UCMP's living history (3) through the Bill Clemens Oral History Fund. Together with you, our Friends, alumni, and supporters, we can meet the goal of furthering the research and education traditions at the UCMP. We anticipate a greater ability to attract new projects, new talent, and new technologies to strengthen our underlying mission. You can make a direct, charitable donation to any of these UCMP funds via Berkeley's secure Give to Cal website. The Anthony Barnosky Honorary Fund for Graduate Student Support provides support for graduate students conducting paleontological research activities in the UCMP. The fund honors Anthony "Tony" Barnosky, a respected and admired professor in the Department of Integrative Biology and a curator at the UCMP whose guidance and mentorship has been instrumental in the careers of many aspiring paleontology researchers. The UCMP Fund for Education and Outreach will support expansion of the Understanding Evolution and Understanding Science websites which, together, generate an average of 20 million page views annually. Guided by the vision, leadership, and talents of Assistant Director Emeritus Judy Scotchmoor, Understanding Evolution and Understanding Science launched in 2004 and 2008, respectively. The sites have been without major sources of funding to enhance what have become the gold standard in online evolution education and resources on the nature and process of science.